Personally, I'm surprised this feature works as well as it sometimes does on a site as busy as this. From an appliication design point of view, what's termed an "incremental" search against a very large database of usernames where information has to go repeatedly back and forth between your browser and the server, is "expensive" in terms of bandwidth between client and server and processor time at both ends of the connection. Given enough resources available at any given moment (e.g. Google's autocomplete or Naver's dictionary search form) it's no problem. But even though soompi is now a much much bigger beastie than in the early days, it's still inevitably way behind Naver or Google in terms of both bandwidth and processing Ooomph. Your example shows an attempt to link to a dcinside page. Have you tried making links to any other sites? DC can be pretty picky about what incoming links it allows. I haven't tried linking to it from new soompi, but I've had no trouble inserting links to other sites. By watching the logs on a server I control as I try to insert a link to that server into a soompi page, I notice that the soompi system appears to attempt to resolve the link before it inserts it into a posting for the first time. If it can't resolve the link, e.g. because of a typo in the url or because the targeted site objects to being linked to for some other reason, then indeed nothing happens in the user's browser, unlike the Vanilla version, where an invalid link could be inserted with its accompanying text, even if clicking on it produced an error. I take this to be a feature rather than a bug. Hello, ​I just tested the feature and it seems to be partially working on my end. Even with the hide status, it still shows the last visited time, instead of just saying NA or private. Yeah I was using my phone, it's not available. There is a "go to last" page button (the forward button/double arrows) on a computer at least. Probably just the mobile version since the button is there on a tablet as well. Minor issue, but worth noting. Thank you for adding it to be checked. Not sure if this is a bug .. but the functions on my toolbar (for posting) have been reduced with several functions missing particularly the font style, font size, color palette, spoiler tag etc... those that we had before. Screencapture of situation is enclosed below. Is it just me or everyone's getting this on how things would be at the forum, editing-wise. 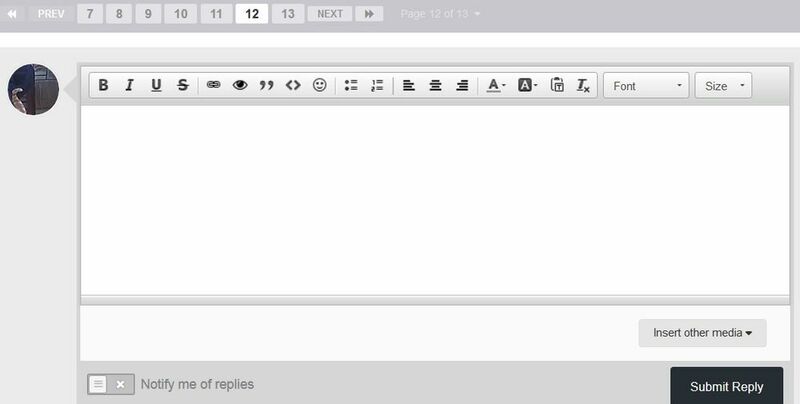 Also, is it possible to have the 'insert image' button on the toolbar instead at the bottom, above the submit reply button. I know this is just a personal preference but often times mistake of clicking the wrong button happen. Instead of posting an image, the reply button is accidentally clicked. I've just done exactly the same thing myself, twice, so I know the feeling and second this point. This is a particular problem on a tab or touchschreen PC, but maybe my thumbs are just too big. I think there are historical reasons why the insert link button doesn't appear on the editor toolbar in Invision as it does in Vanilla, but if the developers are loathe to alter that I think it would be a good idea to shift the "add images" facility to somewhere a lot further from the Submit Reply button. Top of the editing window, just below the toolbar, maybe? Thank you for the response @baduy and took your suggestion -- clearing the browser cache as well as checking the forum using another browser, Mozilla which looks normal with all the edit functions intact. It's on Google Chrome that things go haywire. I seldom use Mozilla and preferred or rather more accustomed to Google Chrome. So, I had uninstalled Chrome to re-install a new version but the result is still the same. Thank you in advance. @soomp and everyone here. ​I'm just an ordinary user, so I can't myself add this to the list of possible bugs for the soompi admins to pass on to Invision, but I imagine they will do that. With your phone, did you try turning it horizontal? (you may have to allow your phone to respond to vertical-horizontal rotation automatically if you've locked your display orientation) I've pestered several friends into letting me try this on their phones, a mix of various Android and Iphone models, and in every case, using landscape orientation made the double-arrow "last" button appear, and tapping it while in that orientation then moving the phone back to vertical orientation allowed access to the current last page. As for you not seeing the problem on your tab, that rather confirms my hunch that this is to do with Invision's "responsiveness" code which detects, then adjusts to, the pixel width of the current display. That's dependent on the screen resolution of your tab. If you have a retina display Ipad, or a top-of-the-range Android device, then the resolution the tab reports to the server will be high enough for it to "responsively" send a full navigation tab-bar even in vertical position. Having also tested this in the emulation software I use of checking "responsiveness" of my own sites on a whole range of devices, I'm pretty confident that this is not browser dependent, nor indeed device dependent (except that devices reporting certain screen widths get a defective navigation bar, but that's not because of the device itself, which is "telling the truth" to the server.) Invision ought to be able to reproduce this without problems, and hence sort out what it is in their code that's causing it. Could you say what your platform is (device and OS version) and what exact version of Chrome you're using? I've tried reproducing this on Windows, Android and Linux with the latest versions of Chrome for each platform, and failed. I can't try it on an Apple OS X or IOS device right now. For me, on all the platforms I can try, Chrome behaves exactly as it does on FF. That means that even if this was reported to Invision as a bug, they might not be able to reproduce, and hence fix, it. So more specific details of your setup are likely to be needed. That could be either down to some hardware issue on your machine, including memory allocation problems, that only Chrome shows up, or to some problem with Chrome itself on your specific combination of hardware and OS. There's a problem about Chrome that produces exchanges on open source developer sites sometimes even more heated than fan and anti-fan battles on soompi. Since it's unlikely to interest many readers here, I'll spoiler it below. It's just possible that some component in the version of Chrome for your platform is clashing with another component on your machine that performs the same function for other browsers using the same common codebase. The best suggestion I can come up with for now is to switch to FF for the time being, but monitor Chrome upgrades (they're very frrequent for most platforms) apply them as and when they appear, then see if the latest upgrade removes the problem. One problem I notice, I accidentally embedded a wrong youtube link and want to correct it by erasing it but it can't be deleted, even when I hit backspace or selecting the whole text to delete it....Is there a way to fix this? ​HTML format is exclusive to the forum staff due to security issues. There is no indication that it will be accessible for the members as well. Which post are you having trouble with correcting the YouTube video? If you provide me the link, I could try fixing it for you. ​I'm using Windows 7 on pc and Google Chrome Version 43.0.2357.81 m ... sorry for not being clear. Honestly, I can adapt with the changes at the forum throughout the years but when it comes to the (probably basic) tech situation, I am totally at lost. Thank you for the help and detailed explanation. This is the actual screencapture of my editing tool on Chrome. Please disregard the other diagram, I added the "buttons' in, thinking it'll help better with the image. There were no other buttons, just a few left. But it's ok, as you said, I can definitely switch to FF to edit the font (mainly for the headings) and also to use spoiler tags. It's not like the worst problem. Thanks again for the tips, appreciate it very much. ​I'm using Windows 7 on pc and Google Chrome Version 43.0.2357.81 m .
I do indeed see the many and various defects of the Invision editor here too (see my previous post). It took me 10 minutes to get a half-way readable version of this post into the editor because the quoted material made the editor go completely haywire, but those are bugs in the current Invision version which affect all client platforms. I really think this is a problem specific to your system. You talked about re-installing Chrome. Did you really do a full clean install (i.e. completely eradicating Chrome from your machine first before installing it again from scratch? Such a full removal isn't as easy as it should be -- if you Google a bit you'll find details on how to do it,. But if you did do a genuine full clean re-install, then this may be a subtle hardware problem which you need to keep an eye on. I very much doubt however if it's something either soompi or Invision could help with. Can someone help me? I recently changed the email for my account and got it verified. But after the verification process, my display name changed. I can't find where to change it back. I tried going on here: https://tv.soompi.com/en/profile/settings but my original username is correct in there. Then I went to Forum Profile to see if maybe that's where I needed to go, but then it tells me that the page I requested does not exist. ​That's quite strange! Usernames on the forum platform are connected to SoompiTV. Hence, the link you provided is correct for display name changes. Could you try again with another email address? If the proposed solution doesn't work, we'll have to investigate this further. Thanks! ​That's exactly it. The old posts that are messed up (that I've seen) all consisted of a quote and then my reply. And now a lot of them are the quoted part, and then...nada. Everything I wrote is gone, so it just looks like I'm a crazy person who goes around quoting people and not replying. Oh well. There's only one that I'm kind of upset about because it was a long post and it was right before the move to the temp forums, but I suspect there's no getting it back now. Also, something completely crazy just happened to me, and I wonder if it's happened to anyone else. I posted something, and then edited something really minor (punctuation), saved it, and immediately noticed in my edited post that the text of the quote in the middle of my post had moved itself to the bottom of the post (it had been where it was supposed to be in the original post, and the part I edited had nothing to do with the quote). Not the quote itself - it was still in place, just empty, but the content in the quote was stuck at the bottom of the post, after my reply. So I hit edit again, thinking I would have to fix it manually, and then everything went haywire, and it looked like 3 or 4 stacked edit boxes (I should have screencapped it, but I didn't), but the quote text was showing up in the right place again. So then I closed the tab without saving the second edit, and when I went back to check after reopening the thread, it was okay, like I meant it to be after the first edit. Weird. And just to add to the chorus: I also have issues with the insert link function. It works about half the time, and it seems totally unpredictable. Posts with quotes and without, any type of link...doesn't seem to matter. And the username mention has worked fine for me for the most part, but today it totally failed on me for the first time, and I have no idea why. No amount of waiting was bringing up any sort of name selection or anything. ​I don't know what happened but my username went back to the way it should be. I came back to Soompi just now since I last posted here and it was still the holybombbatman from my email change. But when I tried to change it to a different email like you suggested, I got sent to a "bad request" page. However, after that, I found that my username went back to 'normal'. This is the sort of thing I mean by the Invision editor in its soompi incarnation having serious problems. My experience is that the more editing you do on a post, the more likely it is to suddenly go crazy like this. That means that users who treat soompi like twitter but with more characters notice nothing. Those who do a lot of quoting, back referencing and replying (i.e. discussion, not just disconnected sounding off) eventually hit this sort of craziness. The pain is that it's impossible to reproduce the behavior in any systematic way. Most of the misbehavior seems to be triggered by editor plugins specific to soompi (or at least not found in the other Invision sites I use). I am reluctantly concluding that they haven't been sufficiently tested out in real-time soompi use. I personally find I'm spending too much time fighting the editor for posting to be much fun anymore, so when the drama I'm currently following ends tomorrow I'll be giving soompi a rest till these problems get fixed. Hi guys - sorry for the delay in addressing these posting issues. I'll need to document them as thoroughly as possible. Being able to edit existing posts was one of the main requirements for moving to Invision, so we'll get this figured out. I'll PM you guys for additional details. The issue with the user group "New Member" with their members having trouble editing their posts has been fixed. hi ya! just wanted to check if there are any plans to incorporate some version/form/plug-in of the reaction buttons to indicate moods and reactions... the forums seem so serious and less fun without them..